The digital wallets war is hotter now more than ever with Google Pay being the latest entry in the market. Other companies who are rooted in this competition are Amazon with Amazon Pay, Samsung with Samsung Pay and Apple with Apple Pay. All these companies have one thing in common,and that is they have mobile payment systems. This means life is getting easier for the consumer and all they have to do is pay attention and get the best mobile payment app for them. Amazon Pay and Google Pay might be providing similar services,but these two are not the same. They might offer the same services at the end,but they are different in how they deliver these services. This is a slight difference if you look at these two services. With Amazon Pay, you just have to open an Amazon account and you can use it anywhere. This means you can use it on your computer, iPhone, or Android phone. Amazon Pay is not limited to a specific platform. Google Pay, on the other hand, is limited to be supported by Android platforms only. Remember Google Pay is the combination of two Google’s services Android Pay and the Google Wallet. That means whatever Google Wallet and Android Pay could do; now Google Pay has the ability to do the same. You cannot use Google Pay on a platform like the iOS platform since it was developed for Android devices and this is why the app is a bit limited. Google is one company that is known to take the security of it’s users very seriously. For this and other reasons, when you add a card to your Google Pay app, the card is stored on a secure Google’s server,and a virtual card is added to your mobile phone. This means that when making a purchase, the vendor doesn’t see your card. The downside to this is that Google tracks and stores the details of your transactions in the mobile app. This is like you have made a purchase and stuffed the receipt in your device. Amazon is a website where you only have to open an Amazon Pay account and use it for making purchases. They also do a few things to ensure that their customers are protected when it comes to paying with Amazon pay. When signing in your account, they take several security precautions. When signing in, your account, you will do so using a very secure server connection that uses the transport security layer or secure socket layer protocol that involves 128-bit encryption, which is the standard in secure server protection. Remember Google pay might be the newest member of the digital wallets market, but that doesn’t mean it has few users as compared to Amazon Pay. Google Pay is the combination of the GoogleWallet and Android Pay and this means they had users even before they launched. Users who had Android pay just have to update their apps on Play store and get the new Google Pay. Amazon pay on the other hand has a lot of users and this is one of its strong sides. It is not a closed system in any way andit is not limited to any platform. This means Amazon Pay has a lot of users and also has the capability of getting many more. They now have the chance to take advantage of the vast U.S market which represents a larger target for Amazon Pay. When it comes to accessibility, Amazon Pay is better off as compared to Google Pay. Even though it is compatible with Android mobile devices, Google Pay can only be used in the developed countries. If you are traveling in the less developed countries and Google Pay is your only hope, you better carry the physical cards. This is due to the technology involved in transactions that most of these underdeveloped countries don’t have. With Amazon Pay, it is available everywhere at any part of the world. It is just like an email address where you just login and send your email. Amazon Pay can send money no matter where you are in the world. It works more or less like PayPal only that it has more users since it is also one of the biggest e-commerce websites in the world. •	Amazon Pay makes it easier to make purchases on amazon.com wherever you are in the world,and you expect your delivery. With Google Pay, you have to be in a developed country where it is supported. 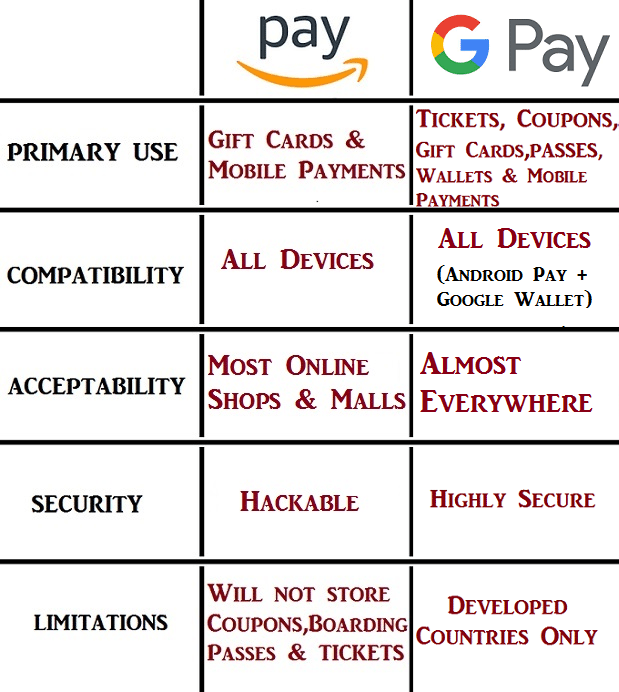 •	Amazon Pay has a more significant market share as compared to Google Pay. This is boosted by the fact that it is also an e-commerce website and the biggest retailer in the US.